What would you do if you found out you were six months pregnant? That’s right and this isn’t a story of a teenager in denial. 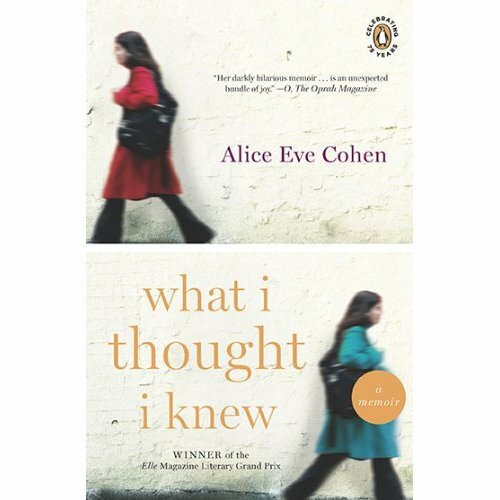 What I Thought I Knew is the remarkable memoir by Alice Eve Cohen. At 44, the divorced mother of an adopted daughter finds herself quite satisfied with her theatrical one-woman-show career and the new love in her life. In the spring of 1999, I indulge in the pleasurable delusion of eternal youth. Michael, my fiancé, is ten years younger. I’m forty-four. He’s thirty-four, but he looks like a college kid, with wayward curly hair, earnest blue eyes, baggy jeans and thread-bare T-shirt, cradling his guitar and singing the song he wrote last night instead of sleeping. But something doesn’t feel quite right. She visits her gynecologist who doesn’t even realize she’s pregnant. Her insurance isn’t quite top notch and she visits several other doctors in New York. After pulling in a few favors, she gets a CAT scan when a doctor is positive she has an ovarian tumor. She finds out she’s pregnant. She also knows that her body is not equipped to carry a baby past six months. This pregnancy puts her and this baby in jeopardy. She considers getting a late term abortion in Wichita, Kansas [the only place to go]. She considers adoption. Alice has some extremely difficult decisions to make. What I Thought I Knew follows Alice through this surprising time. Cohen possesses a crackling, sardonic sense of humor and a realistic outlook on what she wants of her family and her career. Once you start reading her story, you’ll easily become engulfed in her journey. It packs all the suspense and drama of the most twisted mystery. But it’s her real life. Will this unexpected pregnancy derail all her idyllic plans for contentment? This entry was posted on October 9, 2010, 20:29 and is filed under Books. You can follow any responses to this entry through RSS 2.0. Both comments and pings are currently closed.